Nashville’s Craig Smith put the Predators on the board at 17:48 of the opening frame with one of the craziest goals of the season. Kevin Fiala fired a shot on goal from the wing that deflected off of Dallas goalie Anton Khudobin behind the net, where Smith deflected it back into the goal off of Khudobin. The goal was first awarded to Fiala until the replay showed the crazy course of events. The first period would end with the Predators taking the 1-0 lead to the locker room. The second period was a back and forth battle with both teams coming up short on scoring opportunities, and the Predators took their 1-0 lead into the second intermission. Then the third period started and the fireworks were underway. The signing of Brian Boyle and former Predator Cody Mcleod announced yesterday brought a very positive buzz to Smashville and they both hit the ice tonight. Both players bring some size and “grit” to the team for the playoff run. Mcleod has always been a very popular player in Nashville, and Boyle has been to two Stanley Cup finals in his career. 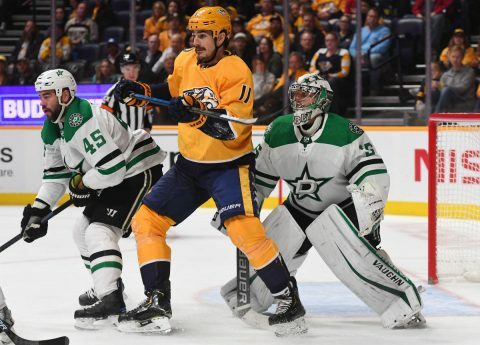 Dallas evened the score at 4:06 of the final frame when Miro Heiskanen grabbed the puck off of a rebound and fired a missile past Nashville goalie Juuse Saros and the game was tied, 1-1. Viktor Arvidsson would give the Predators the lead at 8:41 of the third, taking a Filip Forsberg pass and tapping the puck into the net for the 2-1 lead. Taylor Fedun fired a shot from the point that blew through heavy traffic in front of the Predators net and suddenly the game was tied once again, 2-2. That’s how the game would end in regulation time. In the overtime period, Nashville would put Arvidsson, Johansen and Forsberg on the ice. After winning the opening face-off, the Preds maintained puck possession. Arvidsson would take the puck into the Dallas zone and drew all three defenders to him. Then he slid a perfect pass to Johansen who would plant the puck past Khudobin and the Predators win, 3-2. 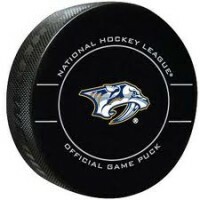 Nashville will play a back to back series against the St. Louis Blues this weekend. Saturday at 1pm IN St. Louis, then back to Nashville for a Sunday matinee at 11:30.